" Trump's SCOTUS Pick Little More Than a Loyal 'Republican Foot Soldier': 'BradCast' 7/10/2018	"
Democrats, abortion rights activists, environmentalists and civil libertarians, among others, are beginning to marshal their forces in opposition to Donald Trump's pick to replace Justice Anthony Kennedy on the U.S. Supreme Court. But that fight will be an uphill battle with unapologetic Senate Republicans who blocked President Obama's pick for the court for nearly a year, now promising a vote before this November's midterms while they still enjoy the slimmest of majorities in the U.S. Senate. 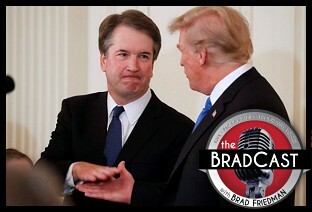 On today's BradCast [audio file to show linked below], we look at the legal history and political background of Trump's nominee for the post, Judge Brett Kavanaugh of the U.S. Court of Appeals for the DC Circuit. We're joined for that conversation by Slate's great legal reporter MARK JOSEPH STERN, who has been covering all things SCOTUS for us of late. Stern counters, among other things, Trump's assertion during his Monday night announcement that Kavanaugh is a "thought leader" and "brilliant jurist". He details how the 53-year old federal appeals court judge uses cookie-cutter legal phrases to describe his "judicial philosophy", as crafted for him by the right-wing Federalist Society and Heritage Foundation. Those phrases --- "A judge must be independent and must interpret the law, not make the law. A judge must interpret statutes as written. And a judge must interpret the Constitution as written." --- betray his years of dedication not to individual liberties or laws or the Constitution, but in service to the cause of GOP politics. "He's doing what Neil Gorsuch did," Stern tells me, "which is to spew out these lines which sound good, if you're not very attuned to legal argot. But what they really mean is 'I'm going to do whatever the hell I want, and I'm going to ascribe this pretextual, orginalist, textualist gleam to it in order to make it seem like I'm maintaining my independence and not just doing favors for Republicans.'" Stern cites, as evidence, a number of Kavanaugh's rulings on the DC Circuit Court, his service on the Ken Starr commission in the 1990s (which led to the impeachment of President Bill Clinton), and his years as loyal White House legal counsel during the George W. Bush Administration. "He is a party man. Brett Kavanaugh is a Republican. He has been a Republican foot soldier in virtually every major Republican legal battle of modern times. He has served that role in his capacity as a judge on the DC Circuit to a 'T'." We discuss Kavanaugh's road-map for overturning Roe v. Wade's nationwide Constitutional right to an abortion, as he laid out himself in his 2017 opinions attempting to block a lawful abortion sought by a 17-year old undocumented immigrant detained by the Trump Administration. But abortion is hardly the only hard-won right that will be, almost immediately, imperiled if Democrats are unable to block Kavanaugh's confirmation to what will become a very hard right-wing Court with his seating. Key environmental rulings are likely to be overturned, Stern argues, as well as those regarding voting rights, privacy rights, and many others. Stern also explains why he remains very dubious, at best, that either Maine's Republican Senator Susan Collins or Alaska's Lisa Murkowski will break from their party to vote against Trump's nominee (Collins, he explains, is "not widely known for having a spine" and Murkowski, so far, has shown little sign of having one either) and why, if confirmed, Kavanaugh could decide to blow up years of precedent by refusing to recuse himself from SCOTUS appeals to cases that he has previously heard as a member of the DC Circuit Court. There is one --- and, really, only one --- thin thread of potentially encouraging news regarding Kavanaugh's nomination. That can be found in his 2009 law review article on whether sitting Presidents may be indicted or face other criminal and civil legal actions. Kavanaugh's written comments on the matter, as we discuss, may, in fact, serve to argue the opposite of what a number of his opponents have been (mis)reporting regarding those remarks. In fact, Kavanaugh's argument suggests a sitting President can, in fact, be indicted under both current law and the U.S. Constitution, for civil and criminal matters alike. « PREVIOUS STORY "'Green News Report' - July 10, 2018"
"Trump's SCOTUS Pick Little More Than a Loyal 'Republican Foot Soldier': 'BradCast' 7/10/2018"
"Stern also explains why he remains very dubious, at best, that either Maine's Republican Senator Susan Collins or Alaska's Lisa Murkowski will break from their party to vote against Trump's nominee (Collins, he explains, is "not widely known for having a spine" and Murkowski, so far, has shown little sign of having one either)...."
Perhaps the only thing holding certain people upright are the strings. Warning: The person writing these words is to the left of Bernie Sanders, who I think is the coolest guy (and the most popular elected official in the US of A). Here it comes. Since I learned, decades ago, of FDR's desire to pack the Supremes as a threat against the efforts to stop his economically progressive agenda, I have been leery toward progressive calls to bring that idea back. It somehow always struck me cheating by buying a pre-chosen outcome not on merit but on an invidious loyalty borne on simple numerical advantage. As you and Mark Joseph Stern observe, there is no provision in the Constitution that forbids expanding the size of the Supreme Court's number of justices. Mr. Stern observed that such a move should be "remedial (and not proactive)" and would be a "proportionate response to what Republicans did to Merrick Garland and Barack Obama." Such an act would, of course require Democratic control of the Congress and the White House, but it would be a response to the stops along the road of the conservative agenda "to return us to the Lochner era" by striking down the progressive decisions that make this country a place that one would actually want to live in. The numerical advantage of a "packed court" is manifest when considering that the advantage redounds to both an institutional protection of democracy and the protection and advancement of a progressive agenda (which would act a feedback loop turning back toward the protection of democracy). In such a scenario, right-wingers would very well live in peace; but they would be denied the ability to molest their fellow human beings (and the earth, for that matter) or to do so without paying dearly for it. Thanks to your interview with Mr. Stern I have now come around to that thinking. I and my wife have been speculating about what would happen if Roe was struck down. Would anti-abortion states really punish women who crossed state lines to get the procedure in a state that had full abortion rights on the books, and how harshly would they if the did? Would the anti states form a kind of "confederacy" so that crossing them out of an anti state on the path into a pro one triggers a kind of "operation condor" style of enforcement, supported by a kind of "Dred Scot" ruling-flavored agreement, where each of the crossed states could press its own charges against the abortion seeker and her accomplices? Would the pro state-domiciled medical professional(s) who did an abortion for a woman who fled an anti state to get to the pro state-located facility be liable in the anti state where the woman came from AND in the anti states that she crossed to get to the pro state-located facility? Would the anti states create a kind of "fugitive pregnant woman law" for women caught in transit, and would the anti states demand a kind of "extradition agreement" with the pro states? Would the anti states demand that women register their pregnancies with the authorities which would then monitor the women's movements? What kind of laws, if we consider the previous questions, would be passed by the anti states regarding contraception? Could the claim finally be made that a woman has no rights that a man is bound to respect? In our speculations things really go downhill from there. We also understand that if Roe were struck down, the likelihood of woman-led backlash from which the Republicans may be unable to recover would greatly increase (and that is an optimistic scenario because such a backlash has not happened in the abortion-restrictive states; rather, it took lawsuits to slow the assault upon reproductive freedom in those states). Your citation David Farris' book and Mr. Stern's consideration of the court-packing idea (without coming down one way or another on it) has me thinking that such a strategy would be one of the few options – and it is a hard-charging one at that – that could help keep this nation, frankly, intact. Trump getting as far as a third Supreme Court pick while the Senate was still in Republican hands would be the opening lines in a national suicide note. It is a lot to ask but could you invite Mr. Ferris, Mr. Stern and any others you and Desi could think of to your show for a kind of round-table discussion that, among other things, would serve to talk us progressives away from the edge – by which I mean the northern border. Because Canada is lookin' real good right about now. That line was a joke in the summer of 2016. It ain't in 2018. What happens if a few "Democrat" senators vote for this guy? That's what happened with Gorsuch. Appreciate the thoughtful response. I too was against the notion of Court packing, as FDR attempted. I would probably be against it, as well, if it was ONLY based on some of the policy matters you cite. But the fact that the majority was simply STOLEN, as brazenly as it was by the GOP in 2016, has led me to feel very differently about such hardball tactics. As we discussed in more detail during my April interview with David Faris, there are a number of such hardball tactics that Dems are now forced to consider if they wish to keep their party --- and this country --- alive, IMO. Mark Joseph Stern is an awesome guest. I love hearing what he has to say, every single time he's on.